SETsquared start-up DoodleMaths, a successful numeracy learning system for children, showcased its unique tech business at a high-profile Royal event. The Queen and the Duke of York attended Pitch@Palace 6.0 at St James’s Palace in London, and chatted to DoodleMaths entrepreneurs Nicola Chilman and Tom Minor about their tablet-based maths aid, which has now gone global. Pitch@Palace was established by the Duke of York three years ago and offers budding entrepreneurs an exceptional opportunity to promote their start-up businesses. Held on Wednesday 2 November, the event saw 12 start-up companies compete to sell their business to an audience of investors, corporates and decision-makers. Nicola presented the pitch for DoodleMaths, which is based at SETsquared’s University of Bath Innovation Centre, and was delighted that the company clinched third and a place on the winners’ podium. Nicola, who co-founded DoodleMaths with Tom in 2012, said: “It was very thrilling to take part in Pitch@Palace event, with some of Britain’s most innovative entrepreneurs taking part. “We are very proud of DoodleMaths, which aims to raise standards in numeracy by providing all children with an engaging and affordable learning tool that is tailored to their specific needs. “In the next year, we intend to reach 10 per cent of UK primary schools and engage teachers and parents in the maths learning journey of every child. DoodleMaths has been a SETsquared start-up member since 2014 and recently won a major distribution deal with a Chinese educational publisher. Following the company’s success at Pitch@Palace, Nicola and Tom are hoping for an introduction to Justine Greening, Secretary of State for Education. Ali Hadavizadeh, Deputy Head of Enterprise at the University of Bath Innovation Centre, which is a part of SETsquared, said: “All the team at the Innovation Centre are extremely delighted and proud of DoodleMaths’ magnificent achievement at Pitch@Palace 6. “When Nicola and Tom attended one of our entrepreneurship courses in 2014, it was immediately apparent to us that they had a great idea and ocean of passion and huge belief in what they wanted to achieve in a subject that they deeply cared about, essentially maths literacy of our school children. “They have since worked very hard, engaged fully with our business support offerings, such as regular sessions with our Entrepreneur in Residence Rosie Bennett, and the Business Review Panel. They have worked with mentors and taken part in investment showcases. “After a year, they were declared investor-ready and took on their first SEIS investment, expanded their team, became a resident member of SETsquared and now are one of our shining stars – and their product has gone global. “DoodleMaths team are a delight to work with and it has been a pleasure to support them. 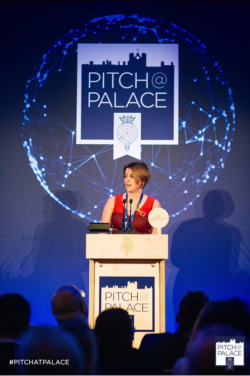 A number of other SETsquared companies also attended Pitch@Palace, including Bristol-based Inductosense, Inclusive Media Solutions from Bristol and Southampton, and Exeter-based Touchbyte. Inductosense has invented a hand-held device known as WAND – Wireless and Non-Destructive system with ultrasonic sensors that can be used to conduct reliable and low-cost inspections of defects in structures. Inclusive Media Solutions has produced EasyVideo to help people with learning disabilities become independent. Users scan QR codes fixed to household items and watch a video that demonstrates how to use it. Touchbyte is developing business applications for customer analytics, people recognition and individual validation using face recognition technology. SETsquared, a joint project between the universities of Bath, Bristol, Exeter, Southampton and Surrey, is the world’s leading university business incubator.